Taking Public Art to the Streets! is located at the entrance to the University of Central Oklahoma’s Center for Transformative Learning. Two weeks ago, the Oklahoma Arts Council and Oklahomans for the Arts hosted the 2012 Oklahoma Arts Conference, and I had the pleasure of attending. The theme of this year’s two-day conference was Building Bridges to Vibrant Communities, which primarily focused on the economic benefits of community revitalization projects. A variety of inspiring tours, panels, and workshops were held, ranging from informational sessions for artists on writing grant proposals, to inspiring seminars discussing the crucial role the arts play in the livelihood of our communities. was designed by Steven Weitzman of Creative Form Liners, Inc. Though all of the sessions I attended carried an important message, I was most profoundly impacted by the moderated panel discussion, Takin’ it to the Streets: Incorporating Public Art into your Community Cultural Plan. Moderated by Debby Williams, panelists Ken Busby, Robbie Kienzle, Randel Shadid, and Larry Walker each discussed the public art sector in each of their towns, Tulsa, OKC, Edmond, and Norman. Several methods and ideas were introduced, offering advice for listeners interested in starting a public art program in their community as well as additional measures that can be taken for further community involvement. One interesting solution to the problem of funding art projects is the private-public funds matching program adopted by Edmond. Through this program, the contribution of a private donor is matched by the city to purchase a work of art to be displayed publically. Due to the success of the program, some 124 pieces have gone up around Edmond in the 10 years of its implementation. By and large, the message of Takin’ it to the Streets focused on the importance of community involvement and how to make the investment of time or money for public artwork projects look appealing. Citizens like the idea of city beautification measures, including public art, and are proud of the work they participate in. The benefits of public art can be quantified, even if an exact number of admission tickets can’t be counted. Public art provides free education to the community and group projects provide a sense of unity within the community. 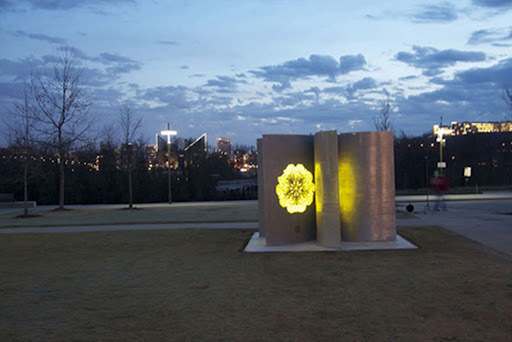 See recent articles in Art Focus Oklahoma about the Oklahoma Art in Public Places as well as the Tulsa, Norman, and Oklahoma City public art programs. As a follow-up to this blog post, we thought our readers would enjoy a look at the completed install of Deedee Morrison’s new public artwork on the grounds of the Southwest Oklahoma City Public Library, 2201 SW 134th St.
Deedee Morrison, an artist based in Birmingham, AL, is installing a new piece of public art on the grounds of the Southwest Oklahoma City Library. 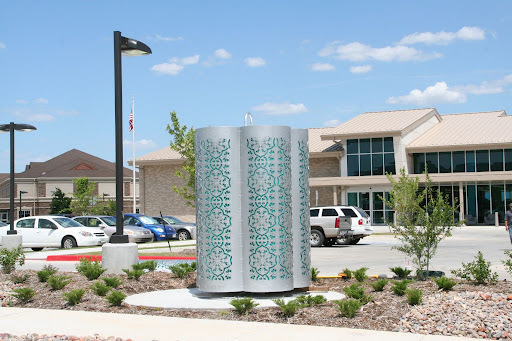 Morrison will begin installation on May 10, 2012 with an official dedication ceremony to be announced. The artwork, entitled Borrowed Light, is a kinetic light sculpture created as a metaphor for the many journey’s of enlightenment a reader can take within the pages of a book. 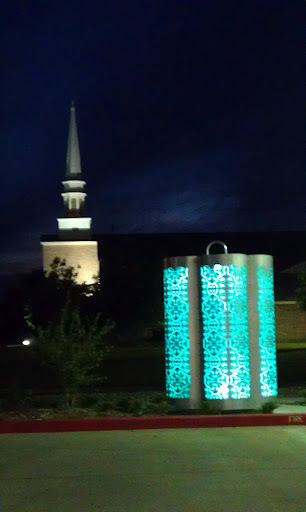 The piece is made from 12 sheets of laser cut industrial grade aluminum, which is illuminated from within to achieve a radiant green color at night. Morrison shared with us a bit about her career and working methods as a public artist. For more information, visit her website at www.deedeemorrisonsculpture.com. 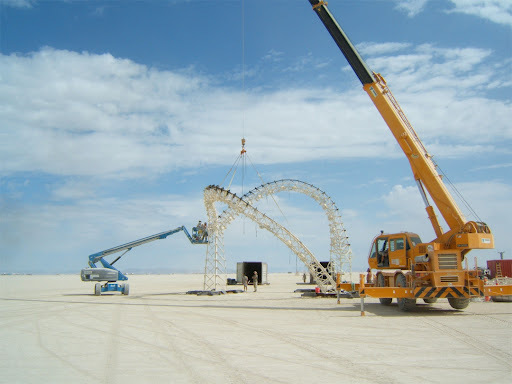 When and how did you decide to make the leap to large-scale works? I actually started my work as an artist as a public artist. I worked as an economist in London for several years out of college, and began taking art classes while I was there. I would travel to all of the outdoor sculpture parks that helped shaped my vision for public art and how it can inspire – given the right setting and scale for the artwork. How do you decide what public art commissions to apply for? Are there certain qualities you look for? The majority of my work comes through the RFP (request for proposals) process. Cities and Percent for the Arts programs around the county send out RFP’s for public art projects and I submit ideas based on the scope/vision of the call. I really enjoy projects that involve the request for innovations in technology and concepts about “looking to the future”. I work in a very industrial setting that is an amazing work environment for an artist. My studio is in the home of the Old Republic Steel Mill and what is now Wade Sand and Gravel Quarry. When I work with rocks out of the quarry, the limestone is harvested from an area with 600 million years of geological history. I think the process of harvesting the stone brings a certain awareness and perspective to my work. The second element of influence is the backdrop of the old steel mill and buildings that brought in the industrial development of this whole region and has now been made obsolete – Republic Steel closed in the ’70s. There is, of course, residue and environmental impact from this period in Birminghamʼs history but at the time, the plant made the most of the known technology at the time by producing by-products from the coke ovens that included gas, tar, light oil, etc. I think itʼs intriguing to think about how technology can continue to answer many of the compelling energy challenges we face today – smarter, cleaner and more energy efficient as we evolve in our understanding of what serves our future and the future of our children best. I see that you carefully consider the site for each work. How does the location of the work influence your design process? 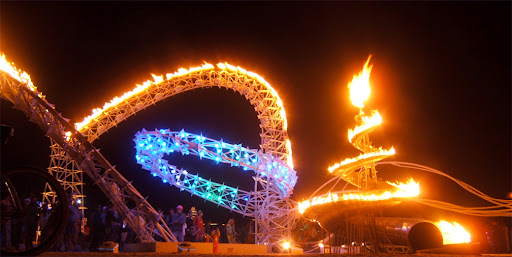 Every site location has a unique nuance that needs to be understood and creatively explored to make sure that the sculpture is congruent and a fluid expression of the public art project. Public Art has the wonderful opportunity of communicating the values and cultural identity of a city. I recently worked on a solar powered light installation, called Seed Pod for the Renaissance Park in Chattanooga, Tennessee. The park is a 23 acre wetland park created on what was once a manufacturing site. The park effectively demonstrates how a polluted area can be returned to a clean river habitat and natural park setting. The design of the park promoted the return of native plants, enhancing the river ecosystems and provides a wonderful balance between urban renewal and the conservation of natural resources. 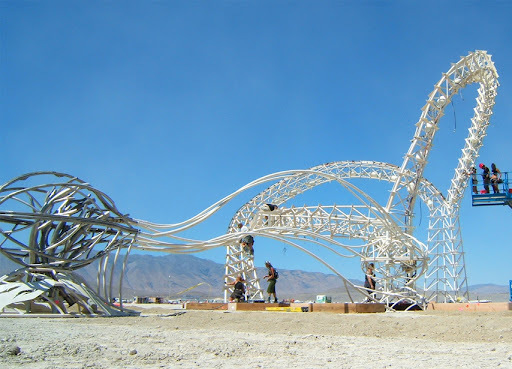 The Seed Pod sculpture works in unison with the objectives of the park. The sculpture is a visual display of the power and energy thatʼs available every day from a single solar panelʼs relationship with the sun. 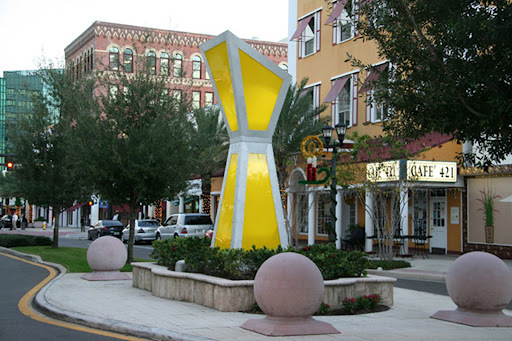 The color scheme of the Seed Pod sculpture mirrors the vibrant yellow hues of the sun. Near the Seed Pod sculpture is the 18ft. 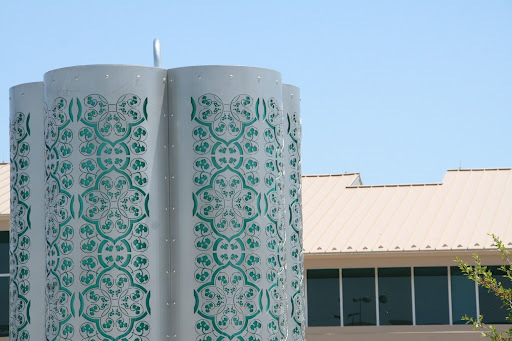 solar tower that, like plants, collects and stores the energy released from the sun. The Seed Pod and the solar tower are intimately connected in the phenomena of life and growth. The solar tower captures the energy of the sun during the day and the Seed Pod emits the dramatic stored light at night, giving the sculpture an added dimension. Any other advice for artists interested in creating art in public places? Don’t give up. I submit many proposals – even today, when another artist is selected. You just have to continue to believe in your own work and vision for your work and push ahead. The greatest satisfaction is to work with city planners, architects and designer on perfecting the concept of your ideas for a public art project, working on the piece for months and then seeing the sculpture installed in it’s new home and feel that it was meant to be there. 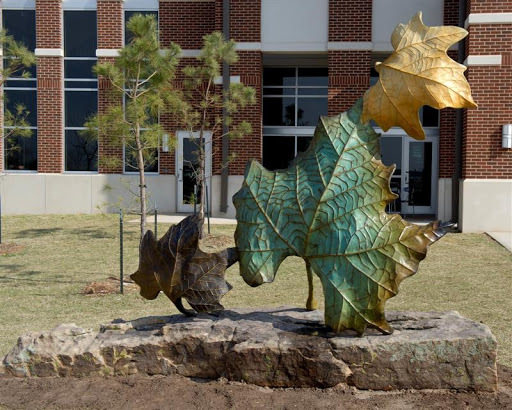 See Deedee Morrison’s new artwork in Oklahoma City at the Southwest Oklahoma City Library, 2201 SW 134th St.
From concept to completion, artist Eric Wright will overview preparing his recent public art commission for the Oklahoma Turnpike Authority in three blog posts. See the first post here and second post on Wednesday. Eric Baker with Mentor Lynn Basa (2nd from L). 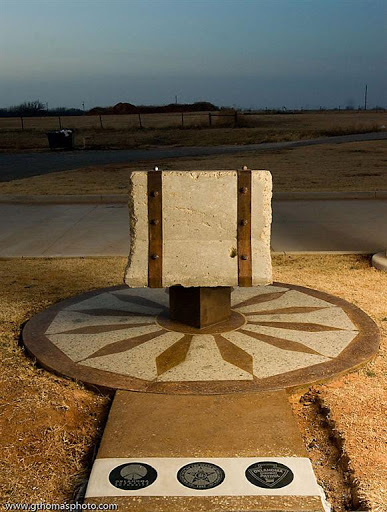 If the Barrier Relic project was not part of a public art mentorship provided by Oklahoma Visual Arts Coalition (OVAC) and Oklahoma Art in Public Places (OAIPP), I probably would have never applied. 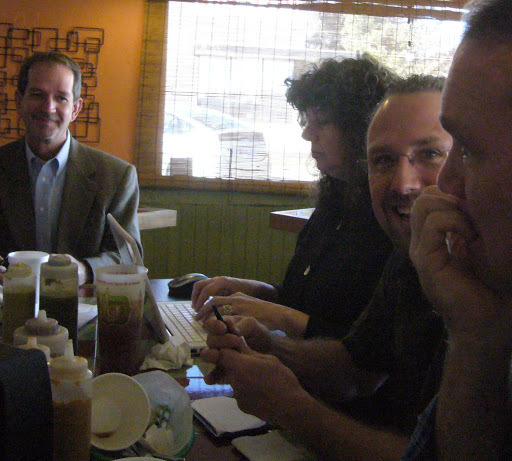 Both agencies strongly advocate for Oklahoma artists and provide so many things to help us succeed as professionals. I knew it could be a great learning experience and seized the opportunity with both hands. OVAC and OAIPP didn’t just bring anyone in as a mentor. They brought an experienced public artist who literally wrote the book on the subject – “The Artist’s Guide to Public Art: How to Find and Win Commissions .” Lynn Basa definitely fulfilled her role throughout the entire process. She pushed hard in the beginning to get all of us on the same page and ready for the demanding first steps. As the project(s) unfolded, she was there to provide advice and support – many of my e-mails had replies within a half hour! She held nothing back, either. If something wasn’t good, she would say so and then offer advice on whatever next step was necessary to correct it. She rode the roller coaster with us the entire time. The most important thing I have taken away from this mentorship is that things truly are what you make them. I had never really engaged teachers throughout school and got by okay, yet have learned in my adult years to jump in and take advantage of opportunities that present themselves. The process of making my first public artwork was a blast! While it might have been daunting, everyone involved was extremely supportive and did what they could to make it a success. The project, with its processes of working with various agencies and contractors, has strengthened my belief that something scary gives you all the more reason to do it. Learn more about the Oklahoma Public Art Mentorship, other artists’ projects and Wright through this Art Focus Oklahoma article or on this page. 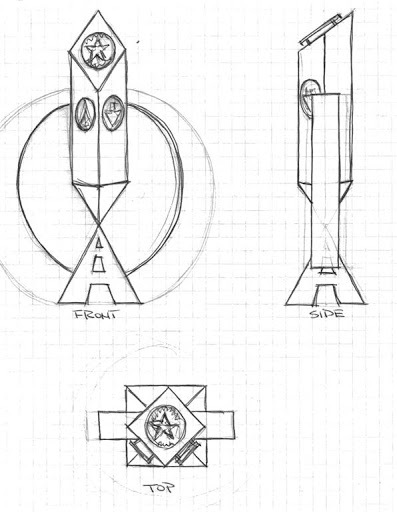 From concept to completion, artist Eric Wright will overview preparing his recent public art commission for the Oklahoma Turnpike Authority in three blog posts. See the first post here. 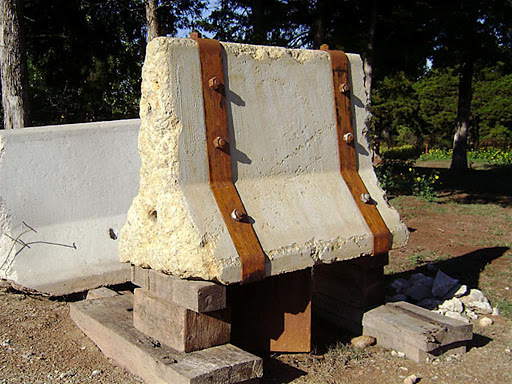 The “Barrier Relic” is constructed from two – very heavy and very strong – Jersey barriers and over two thousand pounds of concrete (it’s not going anywhere!). The skills required for its construction were beyond my use of concrete in my studio work, so contractors were necessary to bring it to life. It took two fellows, with a truck full of tools, two days to slice one of the barriers into twelve pieces. 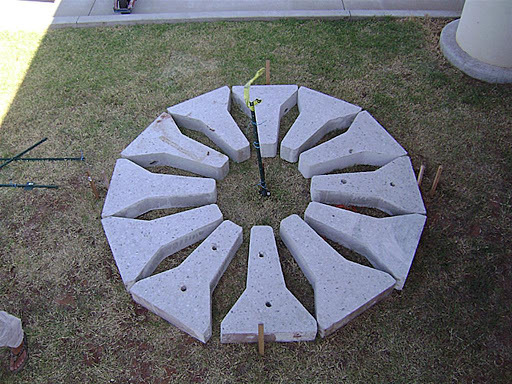 It then took another crew two weeks to create the nine foot circular base. 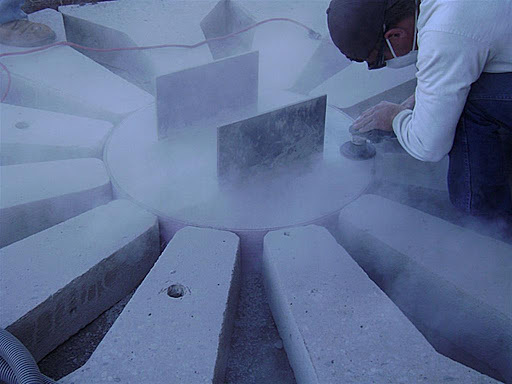 Concrete is a physically demanding medium, and it was a great experience to watch professionals turn it into a piece of art. 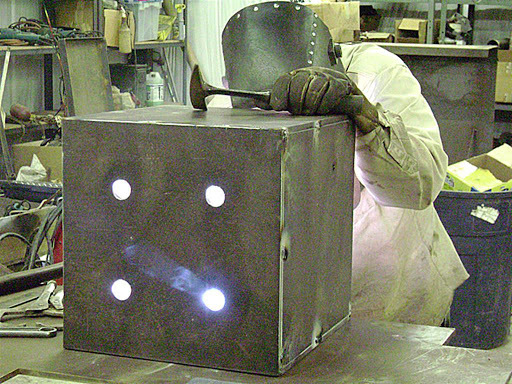 When the onsite base was complete, the relic became the focus at the fabricator’s shop. 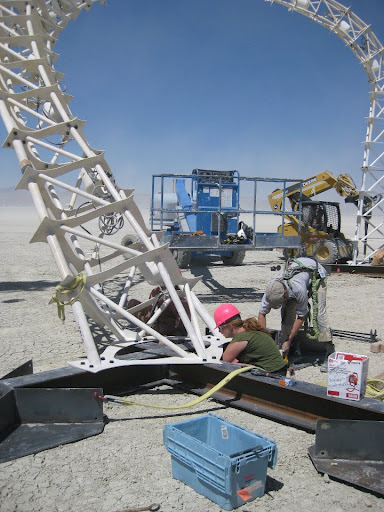 A three week steady pace came to an abrupt slow down as the fabricator is a full time oilfield welder who does other jobs after his regular seventy to ninety hours a week. Still, talented professionals who know what they’re doing can get things done! Once the relic had its patina and was delivered, a less than enthusiastic response from site personnel revealed the dull, rusty relic did not match the smooth, shiny base. Yikes!! Thankfully, this project is a mentorship, so Lynn Basa did a great job guiding me toward a solution of making the relic’s surface match that of the base. Getting that done was really a couple hours’ work, yet it took about a month and a half to fit into the busy contractor’s schedule. 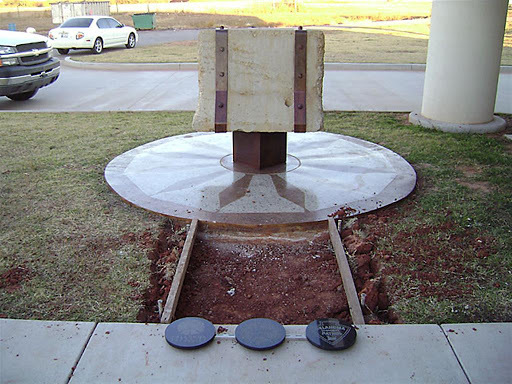 After the artwork was complete, Oklahoma Turnpike Authority personnel and the concrete contractor created the short approach with granite medallions for Oklahoma Turnpike Authority, Oklahoma Highway Patrol and the State of Oklahoma. Throughout the project, I was thankful for a prior career in commercial art, since the artwork is really for someone else besides myself. 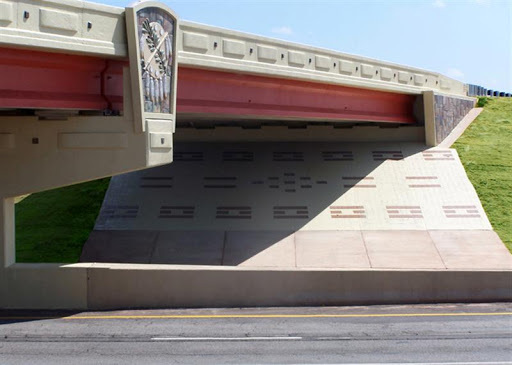 From concept to completion, artist Eric Wright will overview preparing his recent public art commission for the Oklahoma Turnpike Authority in three blog posts. 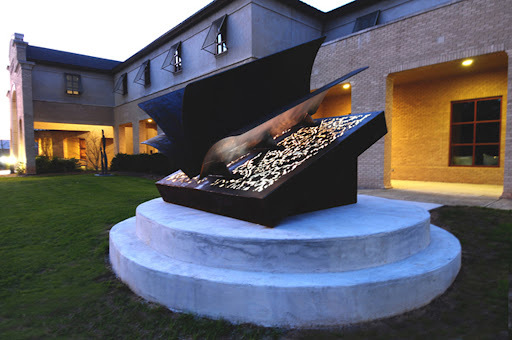 Wright was a part of the Oklahoma Public Art Mentorship, a partnership of the Oklahoma Art in Public Places and Oklahoma Visual Arts Coalition. 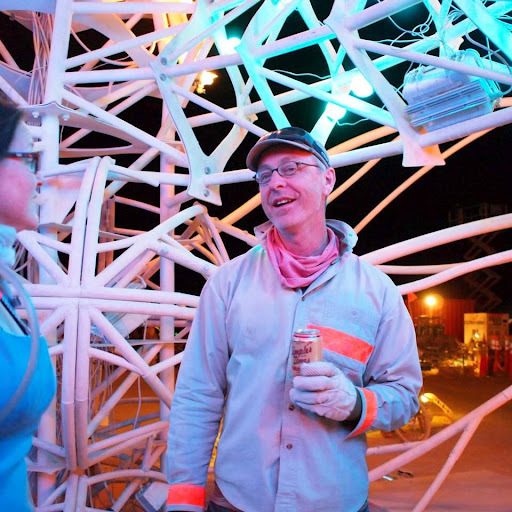 The mentorship allowed Wright and two other artists with no large-scale commission experience to work in mentorship with national public artist Lynn Basa. Basa came to Oklahoma to meet with the artists, trained them in the logistical and business considerations for their projects. She also offered ongoing feedback and advice to help them make their way through the multiple steps of the public commissioning process. The other commissioned artists were Dan Garrett and Eric Baker. Read more about them in this article. Wright kept meticulous documentation of each stage of his project since it began in 2009. I asked him to reflect on the conceptual, logistical and technical development he experienced. For my first ever public artwork, I decided to limit myself to the Jersey barrier. The what? If you drive a car, you’ve seen it practically everywhere you go. It’s that ugly concrete barrier lining construction zones and dividing highways across the country. If you didn’t know it’s called the Jersey barrier, I didn’t either when the project began. 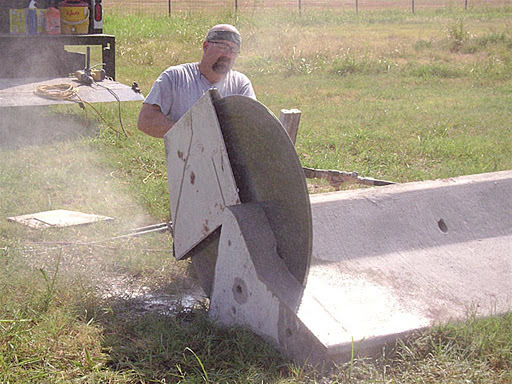 Why the Jersey barrier? The agency receiving the artwork is the Oklahoma Turnpike Authority, along with the Oklahoma Highway Patrol. The site is on the H.E. Bailey Turnpike – near Chickasha – and the overall concept for the artwork is one of safety, as the turnpike tends to be a dangerous work environment. The Jersey barrier lines the middle of the turnpike, and is one element that does its job very well at keeping people safe. Whenever you see tire marks and scars on a dividing barrier, it has more than likely prevented a cross over collision. Because the barrier is so ubiquitous and utilitarian, it is easily overlooked. That is why I decided to restrict myself to only use it in the work. I quickly saw that the profile of the barrier might lend itself to a nice design if it was repeated in a circle. After making a small clay model and moving on to Photoshop to refine the design, I discovered it created a beautiful star. 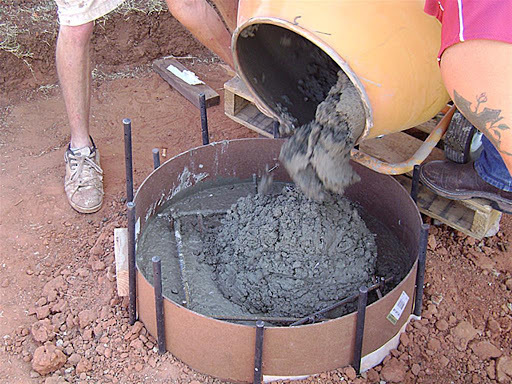 A circular base created from the slices would make a nice foundation for a used section of this unattractive piece of concrete. The concept is to present the barrier in a way for the viewer to reflect on the importance and beauty that can be found in this mundane, everyday piece of concrete. All I had to do now was get a Jersey barrier and slice it like a loaf of bread.